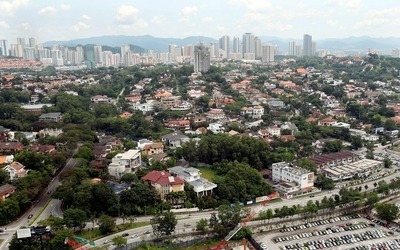 An aerial view of Damansara Heights. There is a clear profile between the buyers of new expensive locations versus the established locations like this area, Bangsar and Bukit Tunku. As one scans through the classified advertisements, a bungalow in Sg Long, Cheras, about 20km from the city centre, is advertised for RM3mil. In Kepong, Kuala Lumpur, terraced housing with built-ups of between 5,000 sq ft and 6,000 sq ft, which is about the size of semi-detached units, in a gated and guarded community were sold for between RM3mil and RM4mil. Corner units are priced about RM5mil. In the high-rise residential sector, the situation is the same. The prices in the same gated and guarded environment is advertised at RM650 per sq ft. In Ara Damansara, a new project is priced at RM700 per sq ft. On a per sq ft basis, the prices of new properties located in the peripherals are creeping up to match the prices in older and sought-after locations like Bangsar and Damansara Heights, one of the most upmarket residential areas in Kuala Lumpur. The above situation may be the answer why sales of new launches are a bit slow today, as some developers have discovered as they take their launches to the market. This is particularly so for those offering high-end residential category, both landed and high-rise. Property professionals say there are a couple of reasons for this wait-and-see attitude by buyers. Valuer and property manager Datuk Mani Usilappan of Mani Usilappan Chartered Surveyors says buyers are still digesting the hefty price rise of the last couple of years. But while that is still going on, something else is happening and that is the pricing of today's new launches, says Mani in a telephone interview. “I can understand why prices in Bangsar are between RM700 and RM800 per sq ft, I don't have the answer why prices in the peripherals are RM600 per sq ft and above. I want to know, and I am sure others also want to know. We have never come across the situation that we are in today, and we, as valuers, also want to know the answer,” he says. He says many of today's new launches are way above the secondary market. The price of new launches today should be closely linked to the secondary market in that area. This may be the reason why people are taking a longer time to decide whether to buy or not. And when they do buy, it is because they need a house in that location to stay. For those who are buying to rent, he does not think the rental will justify the price. Mani, however, adds that there are quite a number of people who are looking for capital gains, and no longer at yields, and may still buy. A property consultant who declined to be named says when prices of new properties in the peripherals creep up to match the pricing in Bangsar and Damanasara Heights, buyers who have that kind of money have a lot more choices. “Once you hit that line and above, developers, or sellers in the secondary market, are creeping into somebody else's market that is better located and is more prestigious. “A developer may be offering a new house but why would anyone who have that sort of money want to drive through hundreds of condominiums to get to his bungalow? It may be a new house, but to people who have that kind of money, new is not an important factor. The most important factor is still location,” he says. He says there are pockets of bungalows which are RM3mil and RM5mil and located far away from the city centre and he finds such pricing incomprehensible despite the house being new or beautifully renovated. On developers who justify their pricing because of the guarded and guarded features, he says this is a concept being sold today, but the over-riding factor is still location. “A guarded and guarded community may have a 20% to 30% premium, but it will still open up the minds and choices of potential buyers, that he now have a choice in Bangsar or Damansara Heights. The basis of pricing depends on location, not concept,” he says. He says there is a clear profile between the buyers of these new expensive locations versus the established locations the likes of Bangsar, Damansara Heights and Bukit Tunku (Kenny Hills). “The buyers are young and most of these newer locations do not have a history. They tend to take huge loans compared with buyers in Damansara Heights and Bangsar who are older, and who opt for smaller loans,” he says. On the slow sales even in the secondary markets like Bangsar and Damansara Heights today, he says the market is saturated. Traditionally, locations like Damansara Heights, Bukit Tunku and Mont' Kiara are the preferred choices of the expatriate community but many of them have left. Coupled with that are the new pockets of developments in these upmarket areas as well as new ones in KL Sentral. “Bangsar, KL Sentral and Damansara Heights are all within close vicinity of each other. The properties launched in KL Sentral may be different but it is still properties. There are just too many new developments being launched today, and there are only so many young people in town to take up these new launches as well as the older ones,” he says. He reckons the same situation is happening in Cheras, where new units are priced higher than older ones. A semi-detached is priced at RM1.5mil to RM2mil, the reasoning is that a bungalow should be between RM3mil and RM4mil. “The sellers do not realise that when they hit a certain price tag, the choice opens up and the potential buyer will think at that price, he may as well live in Bangsar or Damansara Heights. Property consultant C H Williams Talhar & Wong MD Foo Gee Jen says the cautious attitude of buyers are reflected in some ways by the developers themselves. “If you look at launches of high-end landed properties, these are few and far between. The number of units released are also small, maybe between 50 and 80 units. It would be commendable if they are able to sell 50 % of them,” says Foo. He says in the high-end high-rise residential sector, there is an oversupply which explains why buyers can afford to look around. If you look at the past six to nine months, there is a trend that the sales is weakening. The seller who is asking for RM1mil is now asking for RM900,000. “Six to nine months ago, it was the reverse, sellers were pushing prices up. In some locations, the price of new launches are higher than the existing properties. He says the this situation of slowing sales is not helped by tenants moving from the older condominiums to new ones at the same rates of rental as this creates quite a bit of vacancy and bring down the yield, he says. The price of a house depends on the yield and household income. Another reason for the slower sales is financing as banks lend according to valuation and these valuations may not be according to market rate, says an agent who declined to be quoted. As to the direction of the housing market, all of them say buyers will wait for the election if their intention is to invest. The debate on the RM1mil price tag for foreign buyers is only relevant in the capital city of Kuala Lumpur and some of the more affluent Selangor neighbourhoods, parts of Penang and small parts of Iskandar. The rest of the country is pretty much stuck in the RM300,000 RM600,000 category. The current unhappiness expressed by Malaysian house buyers however, are not those in the lower income bracket as there is an overhang of property in the lower price range. 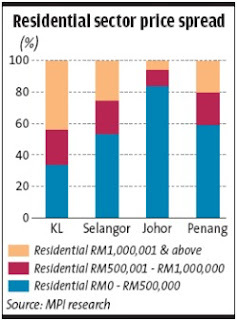 It has to do with the middle-income earners who would like to buy a house in a good location for less than RM1mil. The availability of prime residential land within KL is declining very rapidly and there has been an increase in conversion from residential to commercial. As KL becomes more commercially vibrant, this trend will continue. 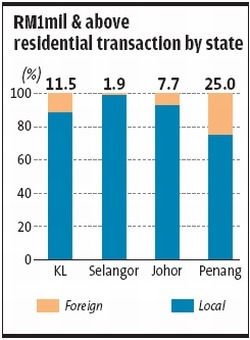 As a consequence, the price of land within the central part of KL is rising. Land owners are acutely aware of this and are profiting from the few available pieces of land in the city as developers bid for these scarce resources. In the case of Johor, foreign property owners are mainly from Singapore. This is no surprise since the largest diaspora of Malaysians are Singaporeans. Given the proximity, close investments and business ties Malaysia has with Singapore, Singaporeans are the biggest real estate investors in Malaysia and vice versa. 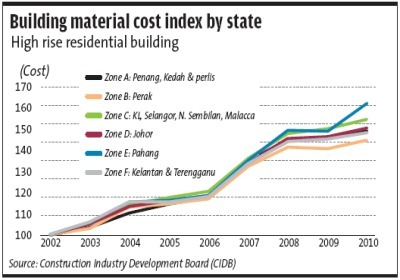 On top of the rising cost of land, construction material and labour costs have been rising. Building material cost in KL increased by +50% since 2002. Developers try to sustain profit margins by raising prices of new launches and testing new grounds for affordability. Should demand be weak, new launches will be re-priced to ensure take-up. Very often, incomplete sales of high-end condominiums which are the less desirable to locals in terms of feng shui, etc are being marketed to foreigners. To raise the value of their projects, developers also add in features to make the development more eco-friendly. Greater KL is embarking on a path to increase its population from 6 million to 10 million by 2020. To ensure a smooth transition, Malaysia could learn from Singapore's experience which increased its population from 4.0 million to 5.2 million in 2011 in just a decade. One of the solutions that Singapore sought was to provide high density mass housing that replicates American skyscraper development. Built at densities of 6000 or more persons per sq km, a growing number of new public housing stock is more than 12 storeys. Under directions of upgrading and density intensification, old low-rise blocks in mature public housing estates are being demolished to make way for new taller developments. The latter ranging from 25 to 50 storeys is developed at higher plot ratios. Approximately 85% of Singapore's 3.4 million resident population has moved to reside in public housing. While there are fears that high density housing reduces privacy in Singapore, this social loss is balanced with high levels of security that is easier to implement in dense cities, which has a higher-skilled workforce and an educated public that contributes actively to crime prevention. Also, point blocks release more land at ground level for gardens and Singapore has a zero car park policy. What will the impact of a RM1mil limit on foreigners be? n It could curb rising house prices that are targeted at foreigners but may not curb the demand from locals. In addition, there are unintended consequences on the business climate if foreign-investor sentiment is affected by random changes in policies. n Whether it will push developers to sell prices below RM1mil will depend on the cost of their land purchase, the plot ratio, construction and labour costs. n Those assets that are selling at slightly below RM1mil may rebrand themselves, above RM1mil to say that they are now targeting the foreign market. Before implementing any drastic changes to curb foreign investment purchases, it is important to ascertain the contributory factors leading to price increases in KL. Malaysia can learn lessons from policy makers in other cities that have successfully grappled with rising city migrants within a short duration. For instance, Malaysia could consult the Singapore Housing Board and policy makers on how they have attempted to plan for the increase in expatriate population. With the proposed solutions, a public-private dialogue can be set up between developers, state housing agencies, Invest KL, Talent Corp, consumer bodies, both local and foreign, to look for long lasting solutions. The dialogue should lead to a shared solution, which ensures future supply of mid-priced condominiums in the city. For instance, through a consultative approach, the government can give a higher plot ratio to help increase the margin of the developers and make it worth their while to target domestic buyers in the land-scarce city. At the same time, the Government can allow developers who have contributed to building mid-range products in the city to sustain their business operations by allowing the liberalisation of foreign ownership in the city ie have no Bumiputra content and no limitation on the sale of units to foreigners. Developers could then target entire projects in the city for foreign direct investment (FDI) and not exclude locals from paying the premium price for the asset. In other words, a 2-part structure like Singapore and Hong Kong. To continue to attract FDI, which is critical for job-creation within KL, Malaysia can adopt the Dubai model, a very simple but effective model. Anyone can open an office in Dubai or buy a Dubai asset. Within a set boundary, work permits are given on demand and business registrations are on a one-day basis. You have to have your office in a designated area but you can live anywhere in Dubai. What if we designated the Federal Territory of KL as a liberal international property investment zone. We can carve out parts that cannot be touched for FDI like Kampung Bahru. The opening of an Investment Zone could be similar to KLIFD, which is still a decade away from fruition. It should be for the whole of KL City Centre say a 10 km radius from KLCC as most of KL is in private sector hands. It will certainly give a boost to our Invest KL and Talent Corp as Malaysia is walking the talk and is inclusive of everybody in the city of KL. It fits in with the 1Malaysia plan, liberalising KL to form an Asean Financial Centre. More developed nations and some of the middle-income countries have been able to balance between development and using FDI to make better options for their people. There are several possible ways of making housing more affordable. However, it is important to examine the consequences of taking such action. For instance, a house price control in the city may stop developers from building within the city. Other alternatives to explore could include, a housing trust that can be set up to acquire a land parcel through purchase, foreclosure, or donation. The trust arranges for a housing unit to be built on the parcel, then sells the building but retains ownership of the land beneath. The new homeowner leases the land for a nominal sum, generally for 99 years or until the house is resold. This model keeps housing affordable for future buyers by controlling the resale price of houses on Community Land Trust (CLT) through a ground lease and resale formula. The CLT keeps the property affordable in perpetuity by restricting the profit buyers are able to take when they sell the house. Up to March this year, Malaysian pension funds have spent US$2.4bil purchasing London property assets. That's RM7.3bil. Was there are any concern from the British press? Or the government? Actually they welcomed sovereign wealth funds coming into the country as they are seen to be passive investors. Why have western sovereign funds not bought passive assets in Malaysia? What has London got that we don't have. The answer stares at us in our face. It's a total lack of government control on who buys what in London. They understand that you can't take the buildings away. So they can happily enjoy the taxes they get from the funds. Canary Wharf which is London's newest financial district has 100 countries fighting to have a share of it everyday. The UK government does not interfere in property transactions. Only collects the taxes and fees that comes with it. London has seen waves of investment from the 70s with the Japanese, Korean, Arab, Russian and now the Asian wave. The city is open to all investors and builders. It is now an international city. The people of London have seen their salaries and fortunes grow as they participate and learn from the legions of investors that have occupied London over the past few decades. There is recession in UK but not in London. We need to make Kuala Lumpur the city of choice to live, work and grow for Asean investors. 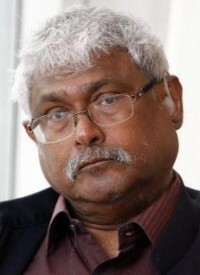 Kumar Tharmalingam is the CEO of MPI. MPI is a public-private initiative set up by the EPU to promote and facilitate foreign investment in Malaysian real estate. MPI raises Malaysia's profile in the international investment radar through constantly updating foreign investors on Malaysia and real estate information. That’s a good one: Star Publications (M) Bhd group chief editor Datuk Seri Wong Chun Wai (right) sharing a light moment with Lim. KUALA LUMPUR: LBS Bina Group Bhd's partnership with China state-owned company Jiuzhou Development Co Ltd (JDCL) is progressing well with layout plans being drafted and likely to be approved by the China government within three months. According to a source, JDCL has paid up 200 million yuan for the land held by Dragon Hill Corp Ltd and both LBS and JDCL are preparing the development layout for the 197-acre property. “LBS and its partner are in the midst of drafting the layout for the mixed development and a resort is in the plan as the property is adjacent to a golf course,” the source said. It added that the layout should be able to get the state government's approval within the next two to three months. On whether LBS is considering any venture into the ferry services which JDCL runs, the source pointed out that the Hong Kong-Zhuhai-Macao Bridge was expected to be completed in 2016 and that might have an impact on ferry services. 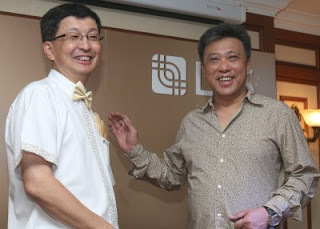 “If JDCL wants LBS to be involved, LBS can be a shareholder and then it will be involved with the developments there,” the source told StarBizWeek at the LBS media appreciation night. LBS managing director Datuk Lim Hock San said the memorandum of understanding (MoU) with JDCL signed last month was coming off to a good start and he would be meeting JDCL next week. “The MoU states that we have to conclude the agreement within six months but, in the meantime, the agreement has not been finalised yet so we have not come up with any mechanism,” he said, adding that he could not share more about the cash and equity deal at the moment. Last month, LBS's wholly-owned Intellplace Holdings Ltd entered an MoU with JDCL's wholly-owned subsidiary, Jiuzhou Technology Co Ltd, for the sale of equity in two of LBS' companies involved in golf club operations and property development projects in Zhuhai. LBS is expected to become a substantial shareholder of the Hong Kong Stock Exchange-listed JDCL from the negotiations. For the Zhuhai project, LBS will not be involved in the financing although it will have a stake in JDCL. Based on the development plans last year, the gross development value of the project is estimated at 17 billion yuan. RAPID changes in the lifestyle and affluence of the people are heralding changes in their way of life. Promoting new lifestyle concepts and ideas in our property landscape should be part of this whole change process to enliven our living space. The living, working/study, and recreational landscapes need to keep up with these myriad changes to bring about a higher standard of living and way of life for the people. Although residential projects are now better designed and built, there is still room for improvement and growth. We can certainly make use of more value adding projects that promote higher quality of life in keeping with the people's higher affluence; and these projects will also add depth to the market. It is perplexing that after all these years, we still do not have lifestyle projects that are dedicated to retirees; or retirement villages that are built to cater to people who have retired from the work force. A recent chat with some “retired” friends invariably touched on why after all these years, there are still no specially-built retirement villages for them and our senior citizens. They pointed out that despite having so many development projects under way and on the drawing board in many parts of the country, none has came up with a retirement village in their project plans. One of the reasons for the disinterest for such projects could be the misconstrued belief that old folks homes are the same as retirement homes, and that they are not lucrative projects to pursue. There may also be a worry of a lack of interest for such facilities in view of the fact that the extended family tradition is still widely practised in our society. Unlike in the western societies who are accustomed to the concept of staying in retirement homes, their eastern counterparts usually prefer to stay put in their own home or move in with their grown-up children when they have reached retirement age. It may also be because of a lack of expertise in such specialised projects as a retirement village is still a relatively new concept here. What we need is a gutsy developer to team up with an established operator of retirement villages to promote some landmark projects to get the concept off to a flying start in Malaysia. We have to realise that the number of retirees who are opting to stay independently on their own is on the rise as a result of lifestyle changes. Preferably they should be located in some nice suburbs with abundance of fresh clean air, lush greenery and yet are relatively close to civilisation and the basic amenities. Although a good number of our senior folks can still fall back on their grown up children to take care of them, many are choosing to live independently for as long as they can. There are various reasons for this to enjoy their freedom to live independently the way they want, while not be a burden to their children. There is in fact a big market for such retirement homes and it should pay off handsomely for developers that start to seriously plan for properly designed and dedicated retirement villages for our retired folks. It is about time we have properly designed retirement villages for them given that their number is on the rise and more of them have the means to enjoy a fruitful and rewarding lifestyle way into their twilight years. As the country ages, so does its citizens. After all these years of toil and hard work, they deserve to live the rest of their life in a safe, pleasant and comfortable ambience. The onus is on developers to study some of the more successful retirement schemes overseas and “localise” the projects by incorporating features and facilities that are tailor-made for the local populace. One of the all time favourites, I believe, will be kicking off with a mature fruit orchard beaming with durian, rambutan and mangosteen trees. First and foremost, the champion for the maiden retirement village scheme in the country should get the objectives and design right from the start - a retirement home does not equal an old folks' home. An old folks' home is basically an institution or home that accepts elderly people to stay for a fee, and usually these homes are fitted with some rather basic facilities such as food, lodging and helpers. On the other hand, a retirement village is a colony of retirement homes that has been purposefully designed and equipped, as well as furnished and fitted with all the proper facilities, environment and ambience, to cater to the special needs of this special group of people. They may have retired but are still fit and healthy to pursue their hobbies and interests. It is built within a safe and secure environment that is close to amenities, and come complete with a wide range of facilities that meet the needs of its residents. These units can either be independent units for those who are still fit and healthy and can still take care of themselves, or catered units for people who need care and attention. They should be equipped with facilities that promote a healthy and enriching lifestyle such as gymnasium, swimming pool, laundrette, library, and elderly friendly features such as ramps for wheelchairs and healthcare providers. These residences are usually available for sale or long leases. But rental should be discouraged because the very reason for opting to stay in a retirement village is for its security and community living, which may be compromised by the presence of the “short term” residents. Deputy news editor Angie Ng knows many ways in which developers can fulfil their corporate social responsibility and one of the evergreen ways is to keep abreast of the needs of the old and young alike by making their developments user friendly and relevant for the people. 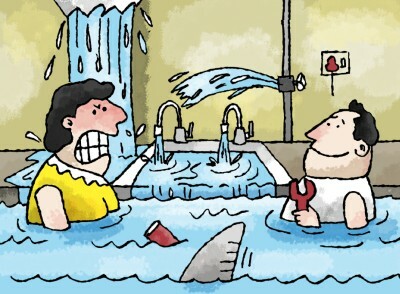 HOME repairs can cost big money, especially when the job requires you to call in an expert. However, for the adventurous few or do-it-yourself (DIY) enthusiast, fixing a leaky tap or hole in the wall is not only a cheaper alternative it can also be a rewarding experience. Granted, the DIY option is not for everybody. But for those willing to “get their hands dirty,” tackling simple household repairs is not as difficult it may seem. Simon Tee, a 42-year old accountant and DIY enthusiast, says there is a wealth of information easily accessible for individuals that want to tackle repairs themselves. “My wife would always complain that I was bad with my fingers,” he enthuses. Tired of his wife's complaints (he jokes) and having to pay ridiculous prices for tiny breakdowns in the house, Tee says he started researching DIY tips “whenever and whereever” he could. Tee says he is now able to do an array of household repairs ranging from simple plumbing jobs to fixing small leaks in the roof. K. Vijay, 37, is a part-time “handyman” when he's not working as a dispatch clerk for a legal firm in the Klang Valley. “I first started fixing stuffs for my family and friends, and then through word of mouth, I became a repairman for hire,” says Vijay with a chuckle. Vijay says he grew up observing his uncle take on household repairs and “learnt the tools of the trade” from him. 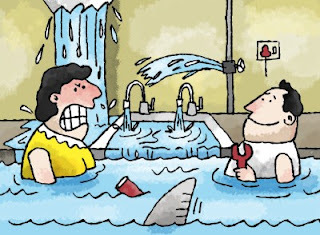 “Learning from an expert or someone who knows a thing or two about fixing things in the house can help save you a lot of money and reduce the need to hire an expert. Sometimes, even the hardware store guy can give you a pointer or two. “Being able to perform simple things like fixing your clogged toilet or leaky tap also provides you with a sense of accomplishment,” he says. “You can get a lot of information from the web through blogs and social media like YouTube. There is a wealth of information out there. You just know where to look and put a little effort into it. Tee adds that individuals can slowly invest in fix-it tools as they take on more jobs. “Instead of buying in bulk, just get the tools that you need. Build (your portfolio of tools) as you go along,” he says. And what kind of repair jobs should be tackled by the DIY enthusiast? Well, that's up to the individual, says Tee. Being non-professionals, there are only so many things that a DIY enthusiast can tackle. Paul Chan, a professional plumber for over 30 years, says hired help does not necessarily have to be expensive. “If you're unsure, ask around and see what other experts are charging. But if it's all along the same line, then you know for sure that you're not being fleeced.” He says individuals should not attempt to solve something themselves just to save a few ringgit. Vincent Liew, a seasoned roof repairman, says there are limitations as to how much a DIY enthusiast can do. “Non-experts should never attempt anything that's dangerous and risky or requires skills and expert knowledge. “Similarly, an individual should not attempt to repair something that requires tools that are either expensive or need expert skills to operate,” he says. Chan concurs, pointing out that safety should be paramount when doing any type of repairs. Regardless of whether you're getting an expert or will be tackling the repairs yourself, the most important thing is to rectify the problem as soon as possible. “Never put to tomorrow what you can do today,” Chan enthuses. “It may cost a few hundred ringgit to repair, but if you let the problem remain, it will only get worse and end up costing you thousands of ringgit,” he says. “This person had a leaky roof but water only dripped into the house when there was a heavy storm, so he let it be. KUALA LUMPUR: DKLS Industries Bhd has entered into a heads of agreement with Selangor State Development Corporation (PKNS) to jointly redevelop a 6.8ha land with a gross development value of RM1.5 billion in Petaling Jaya, Selangor. The mixed development project includes commercial, retail and residential units. DKLS said the redevelopment plan was to complement its corporate strategy to pursue new business opportunities at all times aiming to enhance returns from such investments. PETALING JAYA: DKLS Industries Bhd and the Selangor State Development Corp (PKNS) will jointly participate in the redevelopment of a proposed mixed property project with a gross development value of RM1.5bil. The property developer told Bursa Malaysia that it had entered into a heads of agreement with PKNS to redevelop a parcel of land including the Green Reserve and part of Section 17 in Petaling Jaya, measuring 6.4ha. The mixed development would comprise commercial, retail and residential units, DKLS said. LONDON: UK commercial property is suffering its deepest downturn since records began after uncertainty surrounding the eurozone crisis pushed values down for the second consecutive quarter and more pain looms on the horizon, data showed. Investment Property Databank (IPD) said the value of shops, offices and warehouses fell 0.7 per cent during the first quarter of 2012, following a 0.1 per cent decline in the previous period and were 31 per cent below the last peak in September 2007. The slump is twice as severe as during the previous recession of the late 1980s. TFDC chief executive officer William Ng said the FLCC is a highly regulated and secured investment form that is unique to the Malaysian market and very profitable because it involves a 670ha resort township with approved development order. By investing in the FLCC, investors will have a share in the Forest Lakes Country Club development project in Nova Scotia, Canada. The developer for the project is Terra Firma Development Corp Ltd, a Canada-based property developer, and parent for TFDC. Ng said the FLCC can offer investors up to 80 per cent returns on their investment in the project over a two year to five year period. He said the FLCC is protected with a parcel of land secured within the development and the profit is determined by an independent valuation report prepared by an accredited valuer. "The scheme allow investors to own development interest plots in the project and enjoy capital appreciation. The size of one unit interest plot, is one tenth of an acre," Ng said. The units are sold by prospectus and the scheme was launched here on March 28. Ng said for the initial stage, 500 units are being offered to small-to-medium sized investors. "This is strictly not an income yielding plan but a capital wealth generating scheme with the types of return expected. The scheme is highly secure with multiple exit options for the investors," Ng said. 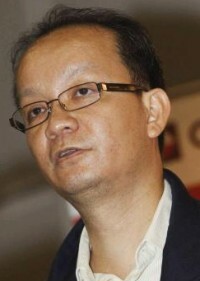 Ng said the FLCC as been approved and regulated by the Companies Commission of Malaysia. All investment is held in a trust by HSBC Bank (Malaysia) Bhd, and managed by Pacific Trustees Bhd. Ng said the FLCC is different than land banking, which is also an investment product but investments are made on unapproved land for development. "Land banking can be a very risky investment due to uncertainty of time on when they can get approval for land classification and development. "Their value increase is subjected to only when the classification of land has been changed to housing," Ng said.